Marxism, Psychology and Social Science Analysis applies Marxist theory, psychology, and the work of Lucien Sève to specific research in the social sciences. It shows in practical terms what guidance can be offered for social scientific researchers wanting to incorporate Sève’s view of personality into their work. Providing case studies drawn from different social sciences that give the book significant breadth of scope, Roche reviews the impact of "Taking Sève Seriously" across the study of international relations theory, economics, law, and moral philosophy. The book begins by placing the work of Lucien Sève in context and considers the development of psychology in relation to Marxism, before going on to summarise the work of Sève in relation to the psychology of personality. 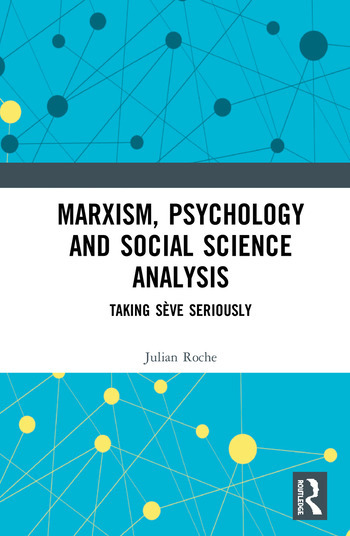 It considers the opportunities for refreshed research in social relations based on developments by Sève, before examining Marxist biography and the implications of Sève’s views. The book also includes chapters on the social discount rate, on constructivism in international relations, on the concept of promising in moral philosophy and the Marxist conception of individual responsibility. It addresses not only how research should be carried out differently, but whether utilising the theoretical framework of other writers, even non-Marxists, can deliver a similar outcome. With its use of five distinct case studies to analyse the work of Lucien Sève, this unique book will be of great interest to academics, researchers and postgraduate students in the fields of psychology, philosophy and social sciences. Chapter Eight: How Should a Marxist Biography Look? Dr Julian Roche is currently researching Continental Marxist philosophy at Edinburgh University. His work experience has been teaching finance applications within executive education.